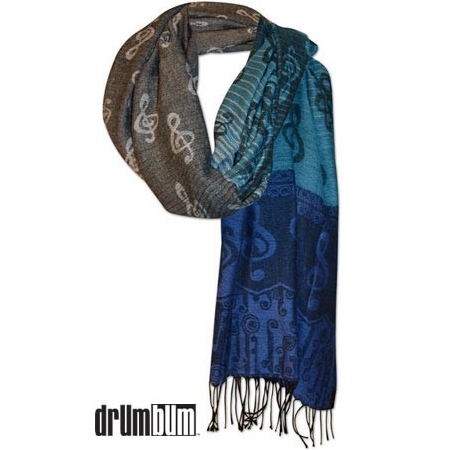 Treble Clef Blue Ombro Pashmina Scarf – This gorgeous lightweight music scarf is perfect for a little warmth or just to add a pop of color to an outfit! Made with different hues of color, the scarf has a stunning ombro pattern with both ends starting in a bold royal blue and slowly transitioning to a light grayish color in the center. Due to the size of the scarf it also works well as a large shawl or wrap. Great for both formal and casual wear. Adds warmth to fall / winter fashion. Made of a pashmina wool blend. The size of this stunning musical scarf is 71″ x 28″. Hand wash/Dry clean only. Awesome Music Note Gifts for Musicians!